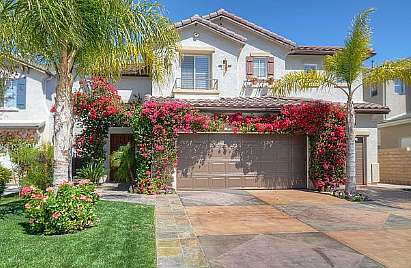 STANDARD SALE...Truly amazing Stevenson Ranch pool home. Spectacular city & mountain views, entertainers yard with pool, patio, and bbq area, and upgrades galore. The beautiful kitchen features custom kitchen cabinets, granite counters, upgraded appliances, stainless steel sink, large pantry, and center island. Beautiful travertine floors with diamond corner cut inserts, new plush carpets, crown molding throughout entire home including window casings. Cozy family room with fireplace and built-in media niche. Large master suite with two walk-in closets, separate jetted tub and shower. Three additional guest/kids rooms with crown molding, plush carpets, new baseboards, and window blinds. Optional 5th bedroom currently a loft. Home also has a large indoor laundry room and three car garage.